HIRO is a visual and performance artist who combines her American experience with her Japanese cultural heritage to create artworks based on East-West cross-cultural themes. Her paintings concern many issues that impacted her life: identity and the community, cultural diversity, civil rights/justice and politics, cities, environment and technology, figure-in-motion and kinetics, self identity and community. 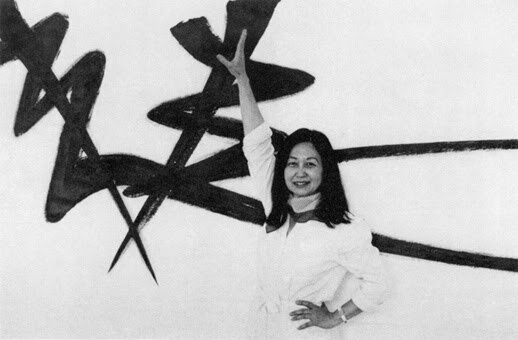 In addition she has developed painting series with titles such as Portrait Biography, East-West Dialogue, Life Cycle, Constellation and Calligraphic Imagery. She curates Asian Pacific American and Cultural Diversity Exhibitons. Using expressionistic brushstroke methodology, HIRO demonstrates and conducts hands-on Creativity Painting Workshops and gives PowerPoint programs on her art and related topics including: diversity, identity, civil right/justice issues, the workplace, goals in education and occupations, and other issues. The most personal and heartfelt of HIRO's art are two major acrylic on silk paintings, “SADA MEMORIES: Thoughts on Justice” and “Justice For All.” Both paintings were in the Smithsonian Exhibition, “A More Perfect Union: Japanese Americans and the United States Constitution” at the National Museum of American History, 1987-2005, Washington, D.C. These works are a part of the 35-painting series entitled, “KIMONO AND BARBED WIRE: Breaking Barriers,” which have been exhibited nationally and internationally. From her childhood fascination with the lights of the cities, HIRO's earliest crayon drawings featured the glitter of buildings, cars, and street lights depicted in broad brushstrokes of colors. Her “City Lights” series of artworks grew from this inspiration. In New York, HIRO began working on a series of Manhattan skyline paintings, then added other cities she had lived in or traveled to across the United States and overseas: Washington, D.C., Chicago, New Orleans, Los Angeles, Tokyo, London, et al. The crowning joy came years later upon having been invited to the press opening topping-off ceremony of the Twin Towers of the World Trade Center upon the completion of the elevator shaft to the rooftop. What a glorious sight to view the vast expanse of New York Bay from cloud level. From Soho she first noticed two towers rising up beyond the skyline during the construction period (1966–1973). Amazed at the sight, she quickly researched the World Trade Center project to discover that the architect was Minoru Yamasaki.